Japan House Los Angeles presents “Satoyama: Evolving with the Forest,” a visual journey celebrating Japanese cuisine and Satoyama — a uniquely Japanese brand of environmentalism — through July 29. “Satoyama: Evolving with the Forest” includes more than 60 photographs by celebrated Brazilian food photographer Sergio Coimbra. The photographs are the product of a three-year collaboration between Narisawa and Coimbra, who traveled together throughout Japan in search of indigenous ingredients from local producers. Larger-than-life photographs of each dish serve as heroic homages to Narisawa’s creations, and capture in stunning detail and color the artistry behind the food. Complementing the photographs are an assortment of objects playing key roles in Narisawa’s practice and excerpts of his journal writings offering insight into the philosophy and inspiration behind each dish. Japan House will additionally present unique prototypes of a new book to be published by Narisawa and Coimbra, featuring handmade covers in traditional materials such as lacquer and handmade Japanese paper (washi). 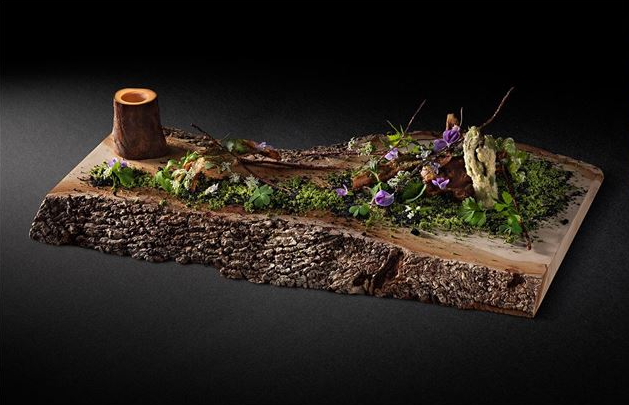 Narisawa’s work is grounded in an understanding and appreciation of the natural relationships existing within nature, and specifically in the forest. These relationships between microbes, plants, animals, humans, and the seasons have been cultivated and passed along by the Japanese for hundreds of years. Forests, which cover 70 percent of the Japanese landscape, contain the ecosystems that sustain communities. By integrating agricultural systems adjacent to forests and harvesting resources in a sustainable manner, humans have truly evolved with the forest. Narisawa draws directly from forests and fields to populate his dishes. Examples include koji, recognized as Japan’s national fungus; binchotan charcoal; tree bark; and foraged leaves. Narisawa’s “Soil Soup” made with actual soil has become one of his signature dishes, which he says “expresses the importance of the environment through what we eat.” His Tokyo restaurant, Narisawa, serves dishes ranging from sea snake broth to wagyu beef, and is regularly included on the World’s 50 Best Restaurants list. The term Satoyama encapsulates the relationship between humans and nature, the core of Narisawa’s practice. Sato means a “place where people live,” and yama means “mountain.” The term can be understood as a uniquely Japanese brand of environmentalism that positions humanity firmly rooted within the natural world, and not as an outlier. Japan House Los Angeles is located at 6801 Hollywood Blvd. in Hollywood. Hours: 10 a.m. to 7 p.m. Sunday, 10 a.m. to 8 p.m. Monday through Saturday. For more information, call (323) 467-7718, email [email protected] or visit www.japanhouse.jp/losangeles.